A busy telephone line can discourage your customers from placing an order. In turn, the high commission costs for food ordering portals may be deadly for your restaurant. Statistics say that more and more restaurants are using the benefits of the automated menu. Therefore, online food ordering system becomes more and more popular on a restaurant’s website or on a mobile application. Check its benefits. Advantage 1: Your customers want to order online! More and more everyday matters are being dealt with online. Ordering food has recently become one of them! Let customers do it conveniently by placing online ordering on your website and use its benefits! Advantage 2: You get more orders! You are opening a completely new sales channel! These are new possibilities for your restaurant and many more orders. Let your customers know that they can order online directly from you and they will appreciate it! The automated menu on the website is really convenient. 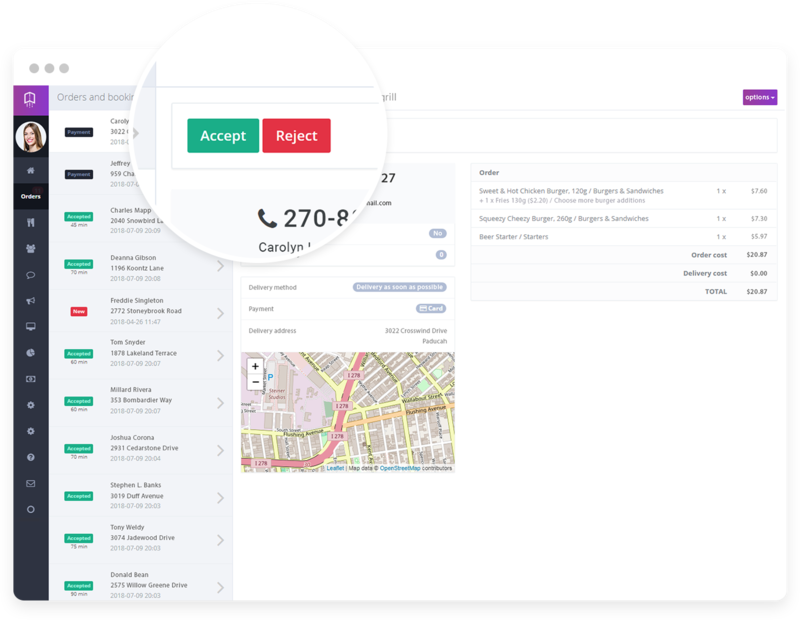 Advantage 3: You can forget about errors when placing telephone orders! Have you or your restaurant’s customer made a bad order? Something interrupted the connection? Or maybe the customer gave up because they got a busy signal? Online food ordering system from UpMenu solves these problems once and for all. Take advantage of the benefits of the online food ordering system and earn more. Placing orders online is convenient for everyone; the customer and you and your team! And, the easier it is to order, the more orders you will make! Advantage 4: You will pay less than on a portal! 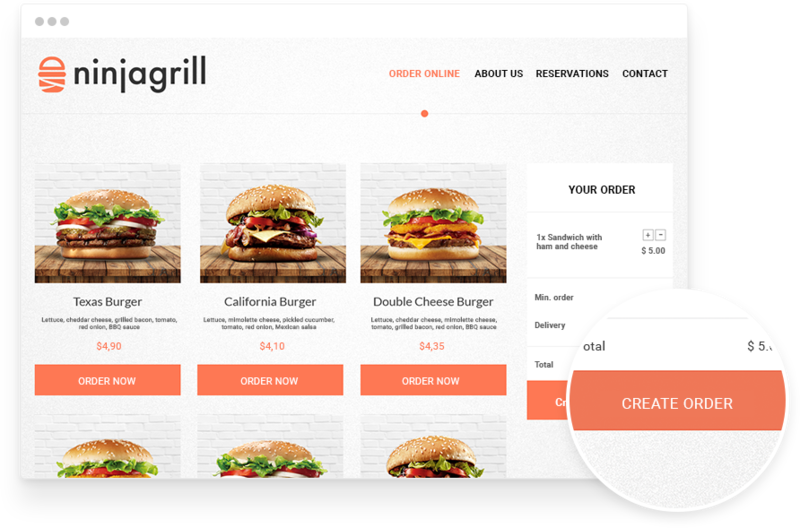 If you’re wondering about online ordering system advantages, think about commissions that restaurateurs have to payout to online portals for a food ordering system can give you a headache. In addition, they grow alongside the number of orders made- infinitely! Lower your commissions by directing all customers to your own online food ordering system, for which you will pay a fixed, low subscription fee. The cost statistics in your restaurant will look better. When placing orders, your clients will agree to marketing contact. 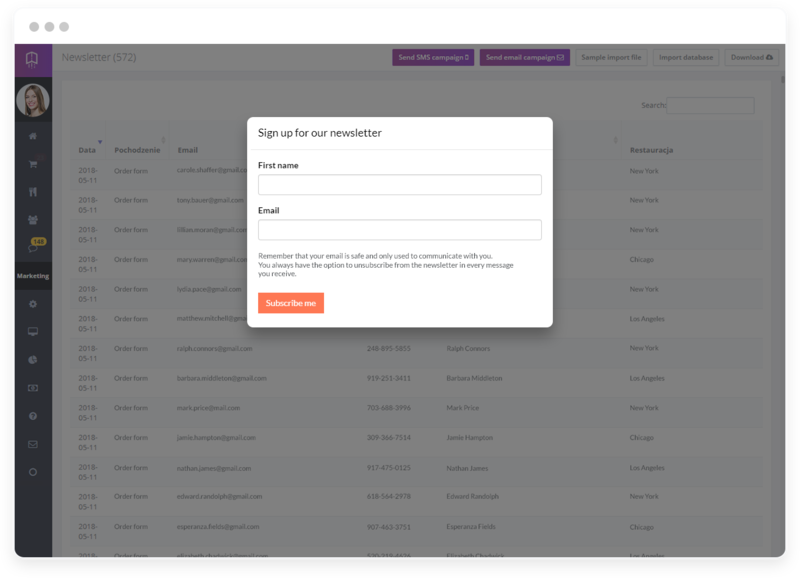 In this way, you will build your own newsletter database and you will be able to send email and SMS campaigns to them – all from the administration panel! Inform your customers about new promotions and products on the menu. Create offers that they will simply not be able to resist and also inform them via new marketing tools! Advantage 6: You will gain totally new methods of promoting your establishment! 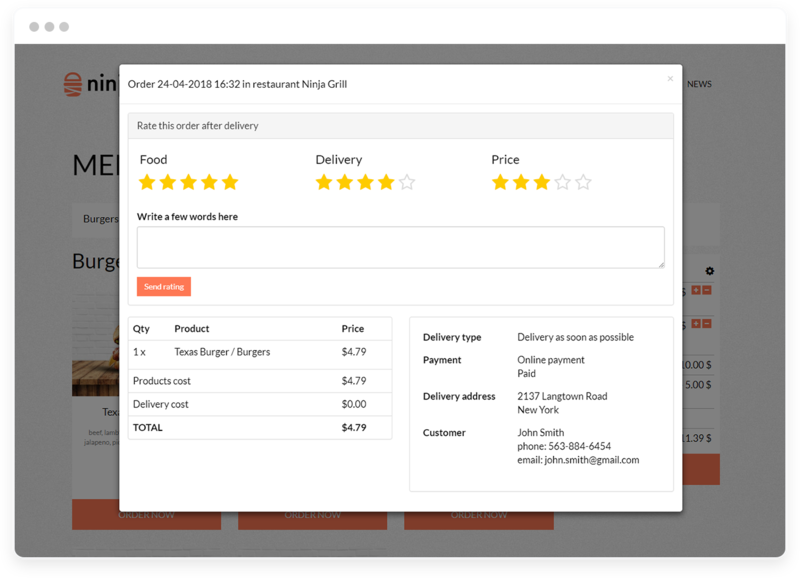 By launching your own food ordering system you will have a real influence on how often your customers will place orders. Due to new marketing functions, you will become even more encouraged! Some activities can be automated. Advantage 7: Your customers will be able to pay faster online! One of the biggest advantages of online food ordering system is that, with online ordering you will stop losing customers who do not have cash on them! Thanks to quick online payments, they will be able to easily pay via the Internet! They have convenience with ordering and you have more food delivery! Advantage 8: Due to automatic opinion collecting, you will learn what your customers think about you! Did you know that, one of the most important benefits of online food ordering system is the ability to collect opinions automatically turns out to be very useful in restaurants. Just think – customers give feedback directly to you. You can quickly, and however suits you, respond to them and also find out what everyone really expects from your restaurant! Advantage 9: The statistics generated will help you organize your restaurant’s work better! 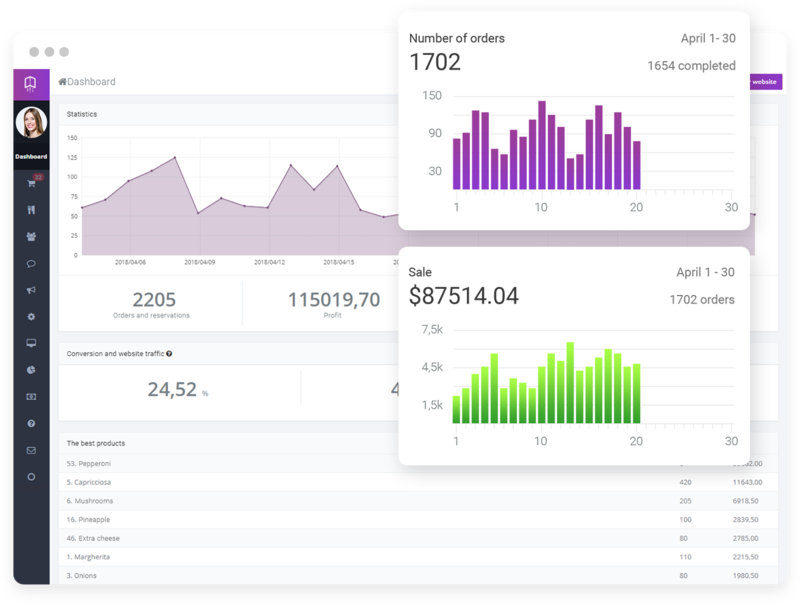 UpMenu system will keep you up-to-date with all online ordering statistics. In this way, you will know, for example, when your customers buy the most, when they buy the least. Which products sell better, and which ones worse, as well as how much in a given period you have earned. All this in a completely automated way! Best online food ordering system has the same benefits for your establishment. It will allow you to earn more, reduce costs, stay ahead of the competition, and organize your restaurant work better! See, How does online food ordering system works. The largest online food ordering system is simply a response to the needs of your customers. They want to order online, if you do not provide it, they will use the benefits that your competition gives them. By running the online food ordering system and giving them its benefits, you increase the amount of food delivery. The online ordering system advantages also include the release of the telephone line. It’s a big benefit. Your clients will no longer be annoyed, and the service will have more time to serve customers in the restaurant and show them its benefits. One of the biggest benefits of the online food ordering system is also the smaller profits for the food delivery portal. Sell online under its own brand and use the benefits of independence. For example, UpMenu automatically builds a newsletter database for you, which is entirely yours. Take advantage of the benefits of the online food ordering system and send SMS and email to your customers. Also consider the marketing advantages of the online ordering system. UpMenu will allow you to build a loyalty program. 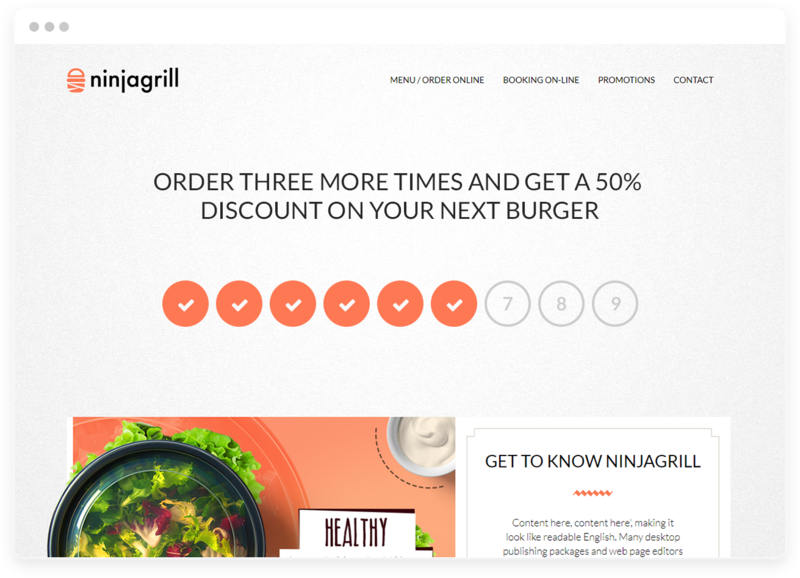 You can reward customers to make use of the benefits of an online food ordering system. They will also be able to give you feedback on the quality of your food deliveries. Thanks to such advantage of online ordering system you increase the quality of services. Better quality food delivery means more profits. If you want to take a closer look at the advantages of launching UpMenu system, contact us! We are happy to talk. Start a free trial and see what benefits the online food ordering system brings to you.